[He] dared to be different, always maintained his artistic integrity, and was apparently indifferent to the consequences. Critics have been variously shocked, delighted and confused by his work. In the United Kingdom the general tone is one of skepticism during his lifetime, disparagement since; he fared better in Europe and the United States of America. . . . [He] applied himself with rigour and equal success to every area of artistic production, becoming a polymath, a quintessential artist-craftsman. The sheer scale and variety of his artistic production daunted the critics. Thus art historian Libby Horner characterizes British artist Sir Frank Brangwyn (1867-1956). Brangwyn produced murals, oil paintings, watercolors, drawings, prints, metalwork, ceramics, glassware, stained glass windows, furniture, textiles—and designed a couple of buildings and many interiors. He worked briefly for William Morris, decorated the façade of the Paris shop of Siegfried Bing who promoted and named Art Nouveau, and was acclaimed by both the Vienna and Munich Secessionists. Brangwyn designs were frequently illustrated in architectural journals and books. Frank Brangwyn never visited the United States. Between 1911 and 1934 he painted murals for buildings in California, New York, Ohio, and Missouri. His mural for the Cuyahoga County Court House in Cleveland (1911-15) was described by the New York Times when it was shipped as “the largest picture ever painted in London for shipment abroad.” His best known works in the United States are the murals he painted for the RCA (now GE) Building, 30 Rockefeller Plaza, New York City (1930-34). In addition to his murals, Brangwyn’s major American presence came from his participation in art exhibitions, beginning with the World’s Columbian Exposition in Chicago in 1893. He exhibited in the first Carnegie International in 1896, and his works were displayed in Pittsburgh at the 1897, 1899, 1902, 1907, 1925, 1926, and 1928 Carnegie exhibitions. The Carnegie Museum of Art owns some of his works, but none are currently on display. This story might well end here but for two individuals who knew both Frank Brangwyn and Pittsburgh—Cuthbert Brangwyn, Frank’s brother, and Frank’s assistant Edward Trumbull. Little is known about the life of Cuthbert Patrick Joseph Brangwyn (1875-1911) prior to his emigration to the United States in his late-twenties in 1903. He apparently settled in New York City and got a job at the prestigious department store, McCreery & Company, established in 1867 by Joseph McCreery. On July 8, 1906, Cuthbert married New Yorker Margaret O’Conner (b. circa 1876). Cuthbert and Margaret moved to Pittsburgh where Cuthbert became designer and interior decorator for McCreery & Company’s Pittsburgh branch. The store had opened in late 1904 in the Wood Street Building, commissioned by Henry W. Oliver and designed by Daniel H. Burnham & Company of Chicago in 1902. The Brangwyns rented apartments on Mt. Washington. They first lived at 58 Shiloh Street, moved to 234 Virginia Avenue in 1908, and in 1911 moved to the home of Dr. E. G. Waller at 55 Wyoming Street. At the 1907 exhibition, Cuthbert displayed designs for an entrance hall and bronze gates. In 1910 he displayed a Louis XVI decoration and a ship’s smoking room. In 1911 he exhibited “The Cathedral Gates”—probably a drawing or sketch—and his brother Frank’s etching “The Bridge of Sighs, Venice”; Cuthbert’s design for a dining room in the style of 18th-century British architect Robert Adam was illustrated in the catalogue. Cuthbert P. Brangwyn, 35 years old, a well-known designer of Oriental rugs and curtains, and for the last five years connected with McCreery & Co., died yesterday in the home of Dr. E. G. Waller, 55 Wyoming street, Mt. Washington. Death was due to heart trouble, with which he suffered for the last 14 months. Mr. Brangwyn was born in England and came to America about six years ago, settling in this city. Mr. Brangwyn was a member of the Architectural Club of Pittsburgh and of St. Mary’s of the Mount Catholic Church. Besides his widow, Mrs. Margaret Brangwyn, one brother, Frank Brangwyn, of London, England survives. The funeral will take place from the home of Dr. Waller, with high mass at St. Mary’s of the Mount Church, at 9 o’ clock this morning. Cuthbert was commemorated in the 1912 Pittsburgh Architectural Club exhibition catalog, and an obituary in The Decorative Furnisher, a national interior design magazine, noted that he had earlier “contributed a series of drapery sketches” to that magazine and stated: “In the capacity of designer Mr. Brangwyn displayed considerable ability, being acquainted with all the period styles and details which go to make up a first-class designer. His death will be mourned by all those who knew him, for in his passing his friends have lost a man of ability, character and strong personality.” Cuthbert was buried in Woodlawn Cemetery, New York City, on May 20, 1911. Edward Trumbull (1884-1968) studied painting at the Art Students’ League of New York. He subsequently worked in London circa 1911 as an assistant to Frank Brangwyn. According to an interview in the Pittsburgh Index in 1917, Trumbull was recommended to Henry J. Heinz by British painter Sir Alfred East (1849-1913) and received the commission to paint murals for the Heinz administration building in Pittsburgh. He returned to the USA in 1911; he lived and worked in Pittsburgh between 1912 and 1920. Trumbull exhibited sketches for “Decoration in the New Administration Building of the H. J. Heinz Company” at the 1912 Pittsburgh Architectural Club exhibition. He participated at the 1912 and 1915 exhibitions of the Associated Artists of Pittsburgh (founded in 1910 and still active). 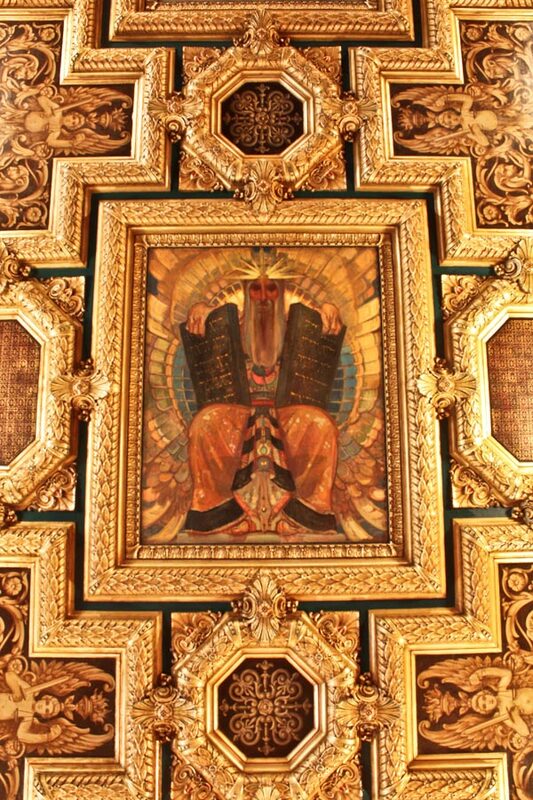 In 1915 he painted two murals — “William Penn’s Treaty with the Indians” and “The Steel Industries of Pittsburgh” — for the Pennsylvania Building at the Panama-Pacific Exposition in San Francisco designed by architect Henry Hornbostel (1867-1961), who practiced in both New York and Pittsburgh. Three artworks — “Chinese Flamingo,” “Royal Dodo Bird,” and “Midsummer” — were displayed at the Pittsburgh Architectural Club exhibition of 1916-17. Trumbull moved to New York City, but continued to collaborate with Hornbostel on Pittsburgh projects, painting murals for the Supreme Court Room in the City-County Building (1923), the Eugene Strassburger residence in Squirrel Hill (1928-30), and the Grant Building lobby (1931). Trumbull’s acclaimed Grant Building mural, “The Three Rivers,” is believed to be entombed above a dropped ceiling, but his Supreme Court Room murals and ceiling paintings are breathtaking: neither as impressionistic nor as boldly colored as Frank Brangwyn’s murals, they are prodigy worthy of a master muralist. Select BibliographyAssociated Artists of Pittsburgh Annual Catalogues 1912, 1915. “Brangwyn’s Big Picture; Painted in London and Destined for Cleveland Court House.” New York Times, 15 November 1913: C4. Cuthbert Brangwyn obits. in Pittsburgh papers appeared in the Pittsburgh Gazette-Times, 19 May 1911, 3, and the Pittsburgh Post, 19 May 1911, 4, and death notices appeared in the Pittsburgh Gazette-Times, 19 May 1911, 7; Pittsburgh Chronicle-Telegraph, 19 May 1911, 5; and Pittsburgh Press, 19 May 1911, 4. There may be others. Horner, Libby. Frank Brangwyn: A Mission to Decorate Life. London: Fine Arts Society/Liss Fine Art, 2006. Horner, Libby, and Gillian Naylor, eds., Frank Brangwyn 1867-1956. Leeds: Leeds City Art Gallery, 2007. Kidney, Walter C. Henry Hornbostel: An Architect’s Master Touch. Pittsburgh: Pittsburgh History & Landmarks Foundation, 2002. McCord, Myra Webb. “An Atelier That is Different: Edward Trumbull’s Unusual Workshop at His East End Home—Murals Are Done In An Atmosphere Remote From Pittsburgh’s Humdrum Life—Mills Offer Great Inspiration.” The Index 36:1 (January 6, 1917), 5, 15. Pittsburgh Architectural Club Exhibition Catalogues 1907-17. Pittsburgh City Directories. Most directories prior to 1930 are available at http://digital.library.pitt.edu/pittsburgh. Tannler, Albert M. “C. P. Brangwyn and McCreery & Company in Pittsburgh.” PHLF News 175 (April 2009): 20-21. “Brangwyn’s Big Picture; Painted in London and Destined for Cleveland Court House,” New York Times, 15 November 1913: C4. Carnegie Art Galleries. Annual Exhibition catalogues for the dates shown above. 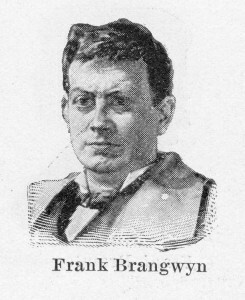 Frank Brangwyn’s portrait appears in the first catalogue of 1896 and in various years thereafter. Family Search International Genealogical Index. See also 1910 Census. Cuthbert P. Brangwynne, designer, is first listed in the 1907 city directory ; this spelling is retained in 1908 but not afterward. The building, on Wood Street between Sixth and Oliver Avenues, still stands but was substantially altered after the department store closed in 1938. Pittsburgh Architectural Club Exhibition catalogues 1907, 1910, 1911. The exhibitions were biannual 1900-1910 and annual from 1910 to 1917. 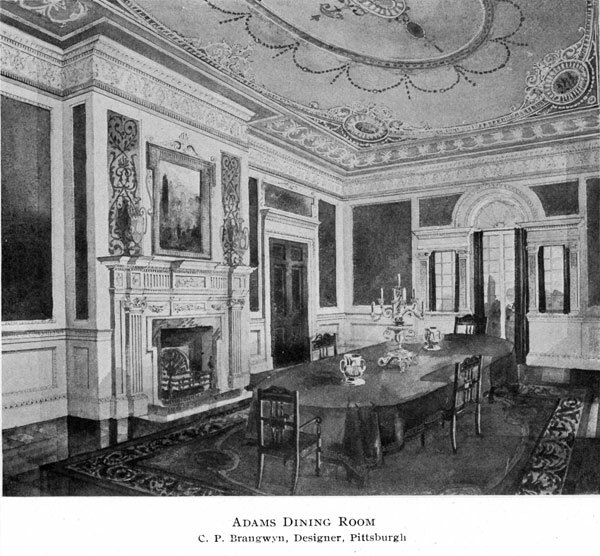 Adams Dining Room, C. P. Brangwyn, Designer, Pittsburgh” is reproduced in Albert M. Tannler, “C. P. Brangwyn and McCreery & Company in Pittsburgh,” PHLF News 175 (April 2009), 21. Pittsburgh Post, 19 May 1911, 4. According to the 1910 Census, Cuthbert arrived in the USA in 1903, however, not 1905. Brangwyn Family Newsletter, April 2003. Susan Olson, Friends of Woodlawn Cemetery: “Cuthbert Brangwyn is here…lot is owned by John Greville and Theresa O’Connor. His wife is not here.” I am grateful to Randal J. Loy for his assistance. Horner 2006 shows a photograph of Brangwyn and Trumbull in the studio . She notes: “Whatever qualities Trumbull may have had as an artist were forgotten when Brangwyn discovered Trumbull was a bigamist.” . See “Miss Dreier Finds She is Not a Wife: Edward Trumbull, Artist, Not Legally Free When He Married Brooklyn Society Girl,” New York Times, 22 August 1911. Myra Webb McCord, “An Atelier That is Different: Edward Trumbull’s Unusual Workshop at His East End Home—Murals Are Done In An Atmosphere Remote From Pittsburgh’s Humdrum Life—Mills Offer Great Inspiration,” The Index 36:1 (January 6, 1917), 5, 15. Edward Trumbull’s Heinz Plant murals have been preserved at the Heinz History Center, the Historical Society of Western Pennsylvania, but are not on display. I am grateful to Kathleen Wendell for this information. His best known works are cheek by jowl in Manhattan—the terra cotta bas relief on the façade of the Chanin Building on 42nd Street between the Chrysler Building and Grand Central Terminal, the ceiling painting “Transport and Human Endeavor” in the Chrysler Building lobby, and murals in the Oyster Bar and Restaurant in Grand Central Terminal. Trumbull murals in Hornbostel buildings are illustrated in Walter C. Kidney, Henry Hornbostel: An Architect’s Master Touch (Pittsburgh, 2002), 46, 145, 169, 173. Albert M. Tannler has been Historical Collections Director of the Pittsburgh History & Landmarks Foundation since January 1991. He oversees the James D. Van Trump Library and the Fairbanks Rail Transportation Archive. Many of his articles about the history of architecture and the decorative arts in Western Pennsylvania have appeared in PHLF News and the Pittsburgh Tribune-Review Focus Magazine. He is the author of Allegheny County Courthouse and Jail Walking Tour (2007), A List of Buildings and Architects in Pittsburgh and Allegheny County 1950-2005, 3rd edition (2005), Pittsburgh’s Landmark Architecture 1785-1950: A Concise Bibliography (1994), and he contributed to African American Architects: A Biographical Dictionary 1865-1945 (2004). He has explicated what critic Patricia Lowry has called “Pittsburgh’s great treasury of historic stained glass” in Charles J. Connick: His Education and His Windows in and near Pittsburgh (2008), William Willet in Pittsburgh 1897-1913: A Research Compendium (2005), and in articles in The Journal of Stained Glass, Connick Windows, and Stained Glass. He has lectured for the Decorative Arts Trust’s Pittsburgh Symposium and at the Frick Art & Historical Center, Pittsburgh, the Charles J. Connick Stained Glass Foundation Ltd., Boston, and the Back Bay Historical Society, Boston.